In Brussels on Friday, after a summit of heads of state and government of the EU Member States, Prime Minister Viktor Orbán stated that for Hungary the previous day’s re-election of Donald Tusk as President of the European Council was about Europe’s operability, rather than about one Member State or another. 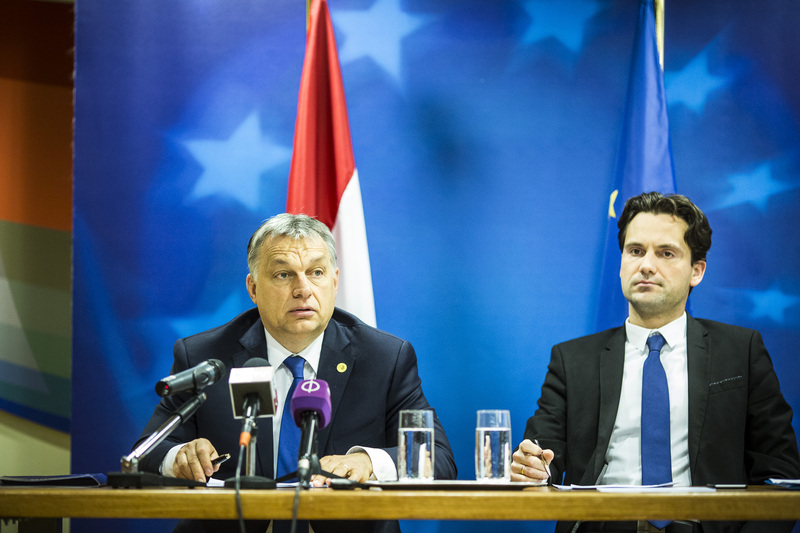 We must accept that European politics operates on party political lines, and Hungary’s governing parties – both Fidesz and the Christian Democrats – belong to the European People’s Party (EPP), Mr. Orbán said. Therefore, he added, Hungary had supported the EPP’s sole, joint candidate. The Prime Minister told the press that he was unable to keep the promise he had made to Jarosław Kaczyński, the leader of Poland’s governing party, because Warsaw’s rival candidate – Member of the European Parliament Jacek Saryusz-Wolski – had left the EPP before the meeting, and thus Mr. Tusk remained the sole EPP candidate. He added that before the EU summit he had written about the situation to his Polish counterpart, Prime Minister Beata Szydło, and so “no one should have been surprised”. He added that “We did everything we could to reach a reasonable compromise, but it is very difficult to reach a compromise – let alone a reasonable one – on the role of individuals”. The Prime Minister said that the Poles could not have won this battle. The decision must be accepted, however, even if there is a Member State which finds it unacceptable. “The decision arrived at just now does not affect the Polish-Hungarian alliance: we continue to stand firmly by Poles on all issues which involve unfair attacks against their country – and there are quite a few of those here in the European Union”, the Prime Minister said. Therefore, regardless of this, he added, Poland can rely on Hungary’s solidarity, and “our appreciation for the Polish people and our friendly feelings towards President Kaczyński remain unchanged”. On Friday, only the leaders of “the twenty-seven” – the EU Member States remaining after the departure of the United Kingdom – stayed on in Brussels to hold an informal meeting on the future of a reduced EU and on preparations for the summit at the end of March marking the 60th anniversary of the signing of the Treaty of Rome, which created the predecessor of the EU. Mr. Orbán stressed that there is a need to define Europe’s place in the new world order emerging after the UK’s withdrawal from the EU, in order to determine what all this means to us, and what consequences it will have. Despite all the difficulties, Europe continues to be the best place in the world, and the goal is to maintain this position, he said. He added that European culture, civilisation and economy has achieved unprecedented results in the period since the Second World War, and there is every chance of Europe being able to offer its citizens the best and happiest way of life in the world. Regarding the future of the EU, he stated that it must be made clear that there shall be no withdrawal of powers from the Member States. “We must not have a ‘two-speed Europe’: there is no first-class and second-class Europe; there is no core and periphery. In general, this whole question of a two-speed Europe is one of the most abhorrent ideas for us. At the same time, through strengthened cooperation we are not opposed to the idea of some countries making more progress than others on some issues. The Prime Minister said that when discussing the new Hungarian migration legislation, the leaders of the Member States did not object to it, as it coincides with current proposals being urged by Germany and Austria. In essence the legislation will ensure that not a single migrant who fails to clarify the reason for their entry will be able to travel on to Germany from the territory of Hungary or to move freely in Europe, he said, adding that everyone will be detained until the reasons for their arrival have been fully established. The Hungarian position is a consistent one and, as well as representing Hungarian interests, it also coincides with those of Germany and Austria, Mr. Orbán said. This, he noted, is because “the situation can only be resolved with legally definitive procedures outside the territory of the European Union which separate asylum-seekers from those who wish to enter the EU for economic reasons”. He stated that the fact that the other EU Member States’ leaders have understood the Hungarian legislation is an achievement. “What we do with the Brussels bureaucrats is another matter, as they are usually the ones who raise objections, and in matters which they don’t happen to like they have powers which they use to try and force Hungary to change its decisions and rules. This battle is yet to be fought”, he said. The Prime Minister stressed that the task is not for migration to be “humanely and well” managed, but for migration pressure to be resisted. The goal of Hungary is to stop migrants from coming to Europe, he said. If a country lets migrants in, it should not send them on, as Hungary does not wish to take in migrants, and does not wish to change either its cultural or its ethnic composition. On the subject of injuries sustained by migrants, he said that he is not aware of a single such incident occurring in the territory of Hungary. He observed that each and every one of these reported incidents took place in the territory of Serbia. The Prime Minister said that he will protect Hungarian police and soldiers “whose duty is to protect us” with the utmost resolve and competence. 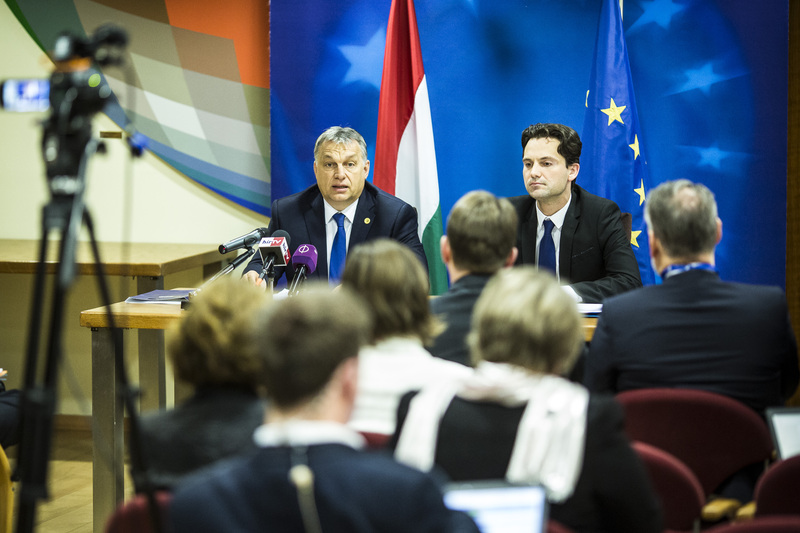 At his press conference Mr. Orbán announced that Hungary will set up a monitoring and tracking committee to monitor whether the situation of Hungarians in Austria is deteriorating due to statutory changes contemplated there. The Prime Minister said that he had bilateral talks in Brussels with Austrian Chancellor Christian Kern, and had let him know that if Hungary experiences any deterioration in the situation of Hungarians working in Austria, “a similar, proportionate situation will emerge” on Hungary’s side of the border. He added that Hungary will also take action in EU forums to ensure that the situation in Austria is brought back within the legal boundaries of the EU. The Hungarian prime minister stressed that until very recently Austrian-Hungarian relations had been working well, and there is no reason for this to change. He said that there is mutual agreement that a general deterioration in relations between the two countries must be avoided, and conflicts should be confined to the specific topics. Mr. Orbán told the press that in Hungary’s view the European Union has no Balkans strategy, and is failing to make use of the most important tool at its disposal: the possibility of EU enlargement. In his opinion, until recently the Balkan region was stable because the examples of Slovenia and Croatia convinced the region’s countries that EU membership was a genuine possibility. The current slowing down of these processes substantially undermine the belief in enlargement as a real prospect, he said, and this belief should be restored as soon as possible – despite the fact that several countries are averse to the idea of enlargement. Regrettably, the positions on this issue are not converging, the Prime Minister added.